The pages of history are red with wars and revolutions. Regional wars, ethnic wars, civil wars and transitional wars have all contributed to major changes in the international political scenario over the period of time. The 18th and 19th centuries saw the Napoleonic Wars, The American War of Independence and The Indian Mutiny. However, it was in 20th century when a great world war not only affected the respective regional histories, but also opened a new chapter in the world history. It was in 1914 when great nations came face to face with each other in the First World War. The European volcano, which was waiting for an excuse to erupt, got its reason to explode with the assassination of Austrian Archduke Ferdinand in Sarajevo, Bosnia. Although the war was initiated primarily in Europe, however, other countries joined in to support their allies (Moss). 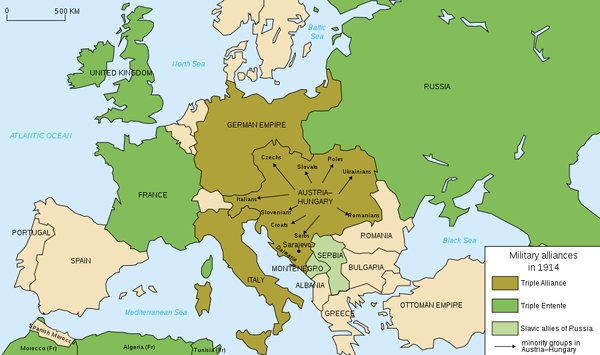 The main contenders were the Triple Alliance or the Central Powers which included Germany, Austria and Italy (later joined the other alliance) and supported by Turkey. They were opposed by the Western Powers, comprising of France, Russia and Britain and supported by Portugal and Japan. In the Balkans, Serbia sided with Russia while Bulgaria supported Germany. In 1917 America joined in the war when German submarines started sinking American passenger ships in the Atlantic. Although the primary reason for the war was the ongoing power struggles in Europe and the Middle East, however, there were other motives involved too. Both Germany and Holland wanted to get into the ‘colonial competition’ with Britain, France, Belgium and Holland. Germany and Britain also had trade rivalries while France wanted to avenge its defeat in 1871 and wanted to recover its lost territories. The greatest war in the history led to the greatest geographical changes on the world map. With the defeat of the Central Powers, the victorious nations met in Europe to draw up the Treaty of Versailles in 1919. The Ottoman Empire broke up and the Europeans divided territories among themselves. The Austro-Hungary Empire was also shattered into pieces and the German colonies were taken away. The First World War led to a new scientific and political era. Inventions related to communications and war technology saw a rapid increase. The Khilafat Movement in the sub continent contributed in the emergence of a new Muslim state. The international power base shifted from Europe to the United States. The infiltration of Jews in Palestine led to a new trouble. Last but not the least, the formation of the League of Nations, which later turned into the United Nations was the most significant contribution of the Great War. Lastly, it laid the foundation for another even greater war that took place two decades later. Duffy, Michael. “A Multimedia History of World War One”. First World War.Com. Moss, Peter. Oxford History For Pakistan. Hong Kong: Oxford University Press, 2005. Strachan, Hew. The Oxford Illustrated History For The First World War. Hong Kong: Oxford University Press, 1998.